Taylor Lindsay ’19 considers herself a hard scientist. She’s used to working in terms of what can be seen and measured. 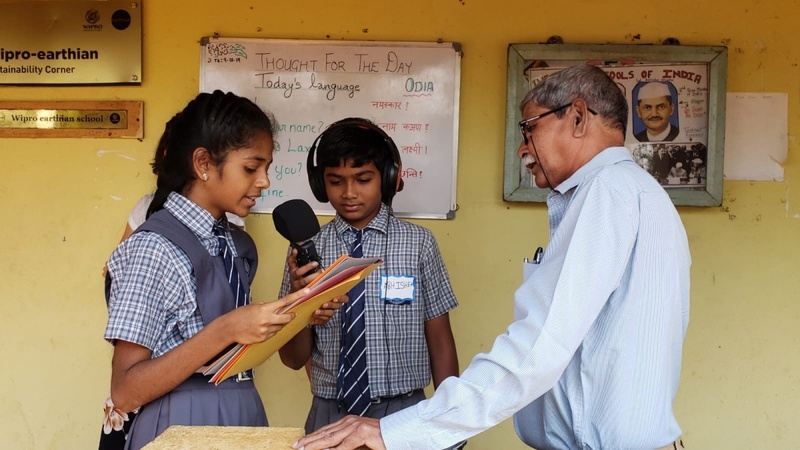 It’s understandable, then, that teaching middle schoolers in Goa, India, how to make podcasts about the environment from interviews with people in their community — something a social scientist might do — was a bit of a challenge. But it’s one she sought out. Lindsay, along with Jordan Garrett ’20, Caitlin Burnett ‘19 and professor Andrew Coppens, spent two weeks in Goa working with a small group of students to help them tell their environmental stories. Garrett agrees. “Learning how to teach with a communication barrier was a challenge within itself, and I think we learned just as much from the students as they did from us," the dual major in environmental geography and sustainability says. "Learning to work in different cultures, understanding their values and how to work with them is a really important skillset to have in an ever-globalizing world." Goa is an old Portuguese fishing port whose white sandy beaches have made it a tourist hot spot. Urban development is stressing its resources and natural beauty. Groups like Green Goa Clean Goa are trying to raise awareness not only with government officials but residents as well. “This is definitely something the kids are taught in school,” Lindsay says. But learning about environmental science through school lessons can lead to rehearsed responses, Coppens says — like everyone talking about the importance of recycling. Before going out in the field, the UNH students helped the middle schoolers identify the story they wanted to tell. They then taught them how to conduct interviews and how use the recording and editing equipment. “We wrote down questions for them to ask, but as they got more comfortable, they came up with their own. That was exciting for us,” Lindsay, an environmental sciences major with a minor in oceanography, says. Goan students creating a podcast. The students interviewed teachers, neighbors, parents, grandparents, street vendors. They asked people what environmental issue they were hearing about and what ones mattered to them. The trip, which was “a study-abroad program, a service trip and a research project all in one” was funded by a UNH Emeriti Council Student International Service Initiative Grant. Burnett, Lindsay and Garrett had a little practice talking science in other another country; in 2017, the trio took their “Weaving Strands of Knowledge: Connecting Culture and Science to Climate Change” project to Bhutan and met with people to discuss the impact environmental changes were having on their lives. The cultural exchange program brought students from Bhutan to the U.S. as well. What began as a collaboration with faculty at SUNY Buffalo and Washington College has, with the trip to India, evolved into a UNH initiative that Coppens hopes will be able to secure future funding to continue. Learn more about grants and scholarships available at UNH.